Portrait, Dan H. McGary, circa 1882. Image available on the Internet and included in accordance with Title 17 U.S.C. Section 107. 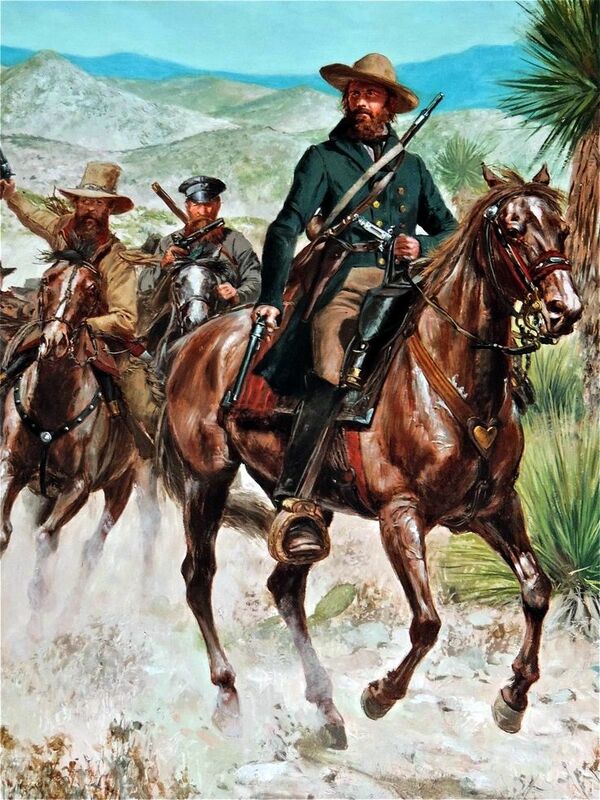 Hays' Regiment, Texas Mounted Volunteers, an 1847 Mexican War print by Don Troiani. Image available on the Internet and included in accordance with Title 17 U.S.C. Section 107. Brenham Banner, issue from August 30, 1887. Courtesy of the Portal to Texas History. Image available on the Internet and included in accordance with Title 17 U.S.C. Section 107. MCGARY, DAN H. (ca. 1820–1902). Dan H. McGary, soldier and journalist, was born around 1820 in Hopkins County, Kentucky, according to his descendants, but in Indiana according to the 1850 census report. After a brief sojourn in Nebraska he immigrated to Texas and in 1840 was residing in Montgomery County, where he owned 1,000 acres and a wooden clock. At the same time he owned an additional 640 acres in Harris County. In 1847, during the Mexican War, he served for six months as a corporal in Capt. James Gillaspie's company of Col. John C. Hays's First Regiment, Texas Mounted Volunteers. After leaving the army McGary lived for a time in Walker County, but by 1850 he was residing in Limestone County with his wife, Sarah. McGary served in the Confederate Army during the Civil War and after the breakup of the Confederacy moved to Washington County, where he established the Brenham Banner in the fall of 1866. An ardent Democrat and fiery opponent of radical Reconstruction, McGary was jailed for his intemperate editorial attacks on military officials, and when he continued to publish his views from jail, his newspaper offices were burned by arsonists; the fire started a conflagration that destroyed most of Brenham. McGary thereupon moved to Harris County, where in 1871 he became owner and editor of the Houston Age. He subsequently moved the paper first to Wallisville in 1897 and then to Beaumont in 1900. He died there on April 22, 1902. He was the brother of Jonathan McGary, who married the widow of George A. Lamb. Sam Houston Dixon and Louis Wiltz Kemp, The Heroes of San Jacinto (Houston: Anson Jones, 1932). C. W. Raines, Year Book for Texas (2 vols., Austin: Gammel-Statesman, 1902, 1903). Samuel O. Young, True Stories of Old Houston and Houstonians (Galveston: Springer, 1913; rpt., Houston: Green Bottle Antique Shop, 1974). Handbook of Texas Online, Thomas W. Cutrer, "MCGARY, DAN H.," accessed April 23, 2019, http://www.tshaonline.org/handbook/online/articles/fmc56.